Google is making a serious push with NFC on Android. As we detailed last night, Android product management director Hugo Barra revealed yesterday that Google is now shipping 1 million NFC-equipped devices every week. Beyond Google Wallet, the company announced some cool new features to Android Beam at I/O on Wednesday, including giving users the option to share video through NFC or pair their phones to other NFC-enabled devices just by tapping it. Last night, Google showcased Beam’s new functionality with two apps, Paper Camera and Tagstand’s Task Launcher. Y Combinator-backed Tagstand, in particular, has been on a mission to make NFC more of a mainstream technology and is starting to pick up steam as a result. Tagstand co-founder Kulveer Taggar tells us that the startup saw a big jump in demand when the NFC-equipped Galaxy Nexus hit stores, so they rebuilt Task Launcher to include a bunch of new features — and a new interface — in March. Sales picked up almost immediately, and they went on to sell as many tags in March as they did during the entire month of June 2011 (when the app launched). Since then, the growth has continued. 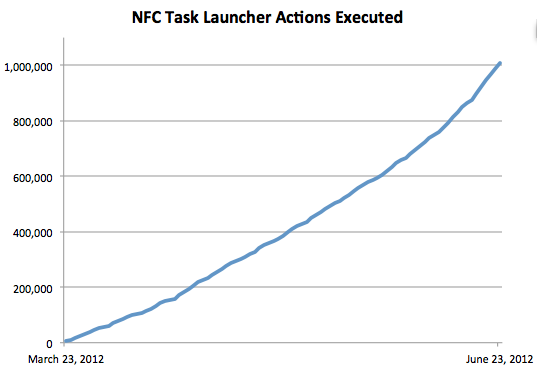 Just a few days ago, Task Launcher passed a significant milestone: One million actions executed. To break that down, of the 1 million actions executed, users changed WiFi and Bluetooth settings 300,000 times, 176,000 applications were launched, phones were set to silent or vibrate 150,000 times, 12,000 songs were played, 10,000 alarms were set, and mobile hotspots were set up 8,000 times. Initially, the app was offered on Google Play for $2, but earlier this week, Tagstand began offering the app for free to further accelerate growth, and which Taggar says has resulted in a 5-fold increase in the number of daily installs. As for some background, in case all of those aforementioned actions confuse, Task Launcher lets users create and use NFC tags to automate tasks you perform in everyday life. Swipe your NFC-equipped phone near one of those tags and your phone will perform specific actions or reconfigure to particular settings once swiped. Using Task Launcher, users can turn on Bluetooth with a swipe of their phone, for example, or turn off WiFi and call up their favorite music app when they scan a tag placed in their car — or even set their phone’s ringer to vibrate, dim the display and set an alarm once they’ve placed their phone on their night stand. The possibilities for this kind of technology are many, so to demonstrate how it could work in the real world, Tagstand has been partnering with events, like one that Sarah covered in May. Attendees were given some digital goodie bags when they arrived at the event, including an NFC-enabled wristband. Taggar tells us that the bands amplified the event’s social engagement to 187K Facebook friends and 32K twitter followers, with 20 percent of the people with wristbands tweeting and 80 percent posting to Facebook during the event using NFC, turning the event organizers into happy campers. Finding success at this event (and several since), Tagstand has since been developing another app, with which it aims to streamline the process of programming NFC tags for everyday users. While there’s a great tag-writing app by NXP already in Google Play, TagWriter doesn’t allow users to do bulk programming. So, Taggar tells us that the team made that one of the key features of its new app — NFC Writer — to let users program multiple tags at once, rather than just one at a time. As a whole, if 9To5Mac is correct and the iPhone 5 launches later this year sporting an NFC chip and an antenna, the technology’s penetration is going to accelerate significantly. So the apps being created by Tagstand (and JFDP Labs’ Paper Camera) give users the opportunity to have some geeky fun with their NFC phones and start making the most out of the technology. For more, find Tagstand at home here.